OHL scoring champion Jason Robertson had a goal and two assists in Friday’s series clinching 4-0 win over the North Bay Battalion. The Dallas Stars prospect put the IceDogs on the board 3:52 into the first period, ripping a power play release past Christian Propp. He proceeded to pick up assists on goals from Jacob Paquette and Jack Studnicka, giving him four points (2-2–4) on the series. Robertson led all OHL players with 117 points this past season including 48 goals and 69 assists over 62 games. Robertson also won a silver medal with the United States at the IIHF World Junior Hockey Championship. He was Dallas’ second round pick in 2017. 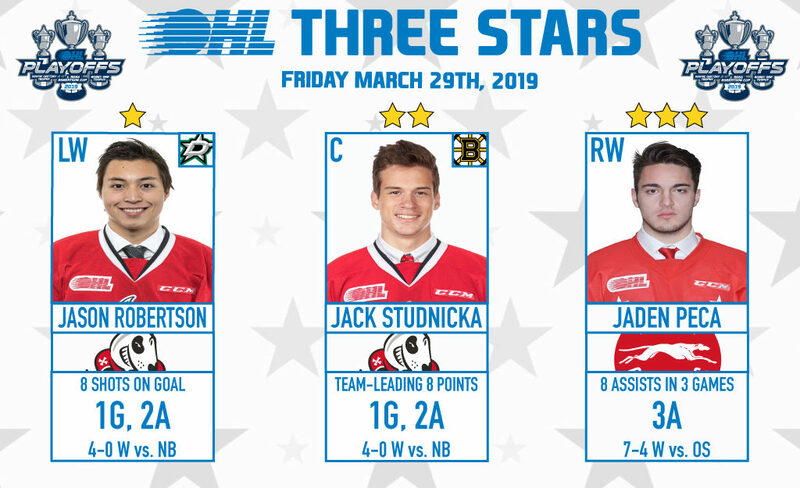 Boston Bruins prospect Jack Studnicka picked up a goal and two assists to push the Niagara IceDogs into the second round of the OHL Playoffs for the fourth time in five years. Studnicka collected assists on goals from Jason Robertson and Jacob Paquette before banging in a rebound with 6:35 remaining in the third period for his fourth goal of the playoffs. Studnicka leads the IceDogs with eight points (4-4–8) in the series. He collected 83 points (36-47–83) over 60 games between Niagara and Oshawa this past season. Studnicka represented Canada at the IIHF World Junior Hockey Championship. He was Boston’s second round pick in 2017. Jaden Peca picked up three assists for a second straight game as the Soo Greyhounds won a fourth consecutive contest, eliminating the Owen Sound Attack from the OHL Playoffs. The Hounds took a 7-4 decision at home in Game 5 on Friday as Peca picked up primary assists on goals from Keeghan Howdeshell, Alex Johnston and Ryan Roth. Peca has eight assists over his last three games after finishing the season with 37 points (12-25–37) over 61 games between Sault Ste. Marie and Barrie. The third-year winger from Woodbridge, Ont. was originally a sixth round pick of the Colts in the 2015 OHL Priority Selection.